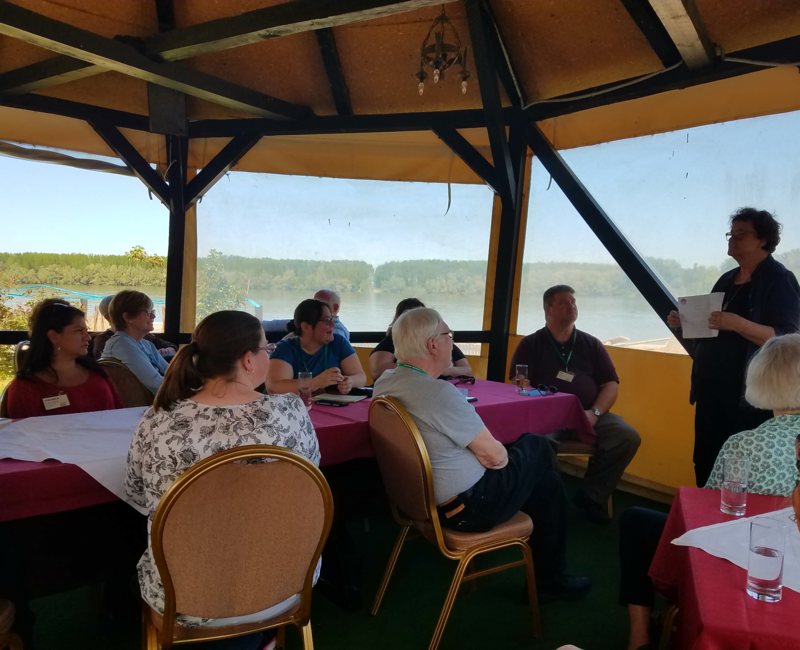 Enjoy a sampling of the Travel Logs written by members of Leadership Wisconsin Group XVII as they traveled across Croatia in April/May 2018 learning about entrepreneurial leadership. We arrived in Osijek, in the northeastern part of Croatia on Saturday evening from Zagreb. We traveled four hours through the countryside colored by vibrant greens and yellows. It feels more like summer than spring. Windows are open and sandals are on! 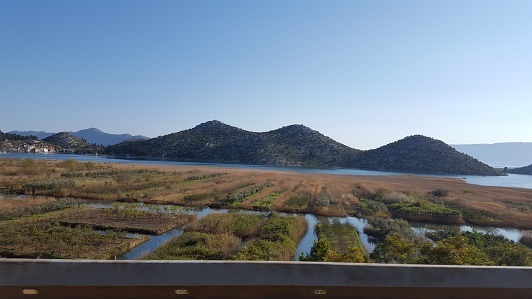 What amazes are the similarities in the landscapes of Croatia to western Wisconsin. The rivers and hills here are somewhat like the bluffs along the Mississippi. The land in this area of Croatia, used for vineyards, grains and animal husbandry, has been worked for centuries! Because of its fertility, it endured the ravages of war evidenced as recently as the 1990’s. We walked down the streets of Osijek, Saturday evening, savoring the beauty of the people, parks and art. We noted, however, buildings both renovated and those still pot marked by the shelling of war. Dinner, by the River Drava, brought time to share and reflect before settling in our hotel for our first good night’s sleep since leaving Chicago on Friday afternoon. It has been worth all the effort! War carries a burdensome price tag. To clarify just how long and lasting it is, Joan Gillman, Emeritus Faculty Member from UW Madison introduced her colleague, friend and “sister” Slavica Singer, Professor Emeritus of the Faculty of Economics in Osijek, to us. These two women exemplify the wisdom of collaboration, vision, courage and tenacity in the face of incredible obstacles. Slavica shared what strides are being made since the last war, to develop entrepreneurial leadership as Croatia continues to recover and rebuild its people torn apart by political, economic, ethnic and religious conflict. Slavica learned through successes and setbacks that healing and growth take more than money. The ability to develop new ideas and markets across the rifts is needed. Rebuilding trust is more difficult than restoring buildings. It is, however, an important path to healing and peace. The leadership of these two women demonstrated a way that works. We are the beneficiaries. Slavica Singer speaks to the group about leadership and economic development efforts after the Croatian Homeland War. Bank of the Danube River, Vukovar, Croatia. Our second full seminar day in Osijek focused on entrepreneurship. After the usual tasty breakfast (mmm, chocolate croissants! ), we took the tram to the BIOS Incubator, a linchpin in the development of private business after the Homeland War between Croatia and Serbia. Our first speaker, Tomislav Barbaric, is the Director of the Center for Entrepreneurship Osijek. He explained how possible candidates to develop a business apply to the Start Your Business program, where the individuals and ideas are interviewed and evaluated to see if each reflects a probability of success. Guidance and advice are provided if the idea is approved and a presentable business plan created. The European Union (of which Croatia is a member), does consider financial help if the plan will result in products or services provided to EU nations. We then heard from Jean-Pierre Marcic, the Project Manager for BIOS. He related how the Croatian universities do not offer significant courses in IT or business, with most students majoring instead in Economics or Law. As a result, BIOS seeks to encourage all persons who may have a technical or IT interest to attend various workshops or seminars. Some include: Hour of Code (focusing on younger students, now in over 400 schools); Hackathon (a daylong competition for students and young adults to competitively apply their skills to create code or design video games; gotta change that name though! ); Pixie Dust (a program attended by over a hundred ‘techie girls’ ages 13-18); and Woman 2.0 (a program for women over 18). Those who develop IT skills become prime candidates to use the incubation services of BIOS: workspace, office furniture, advice and support all aimed at a business succeeding. Some have remained at BIOS, while others move out into the community. Besides the IT spaces, other options have been used for metal machining, furniture making, and similar projects. Next we heard from Suncica Oberman Peters, Ph.D, Vice-Dean of the Economic Faculty of Osijek. She gave an overview of the efforts of her and colleagues to emphasize and support entrepreneurs coming forward in the wake of the Homeland War. 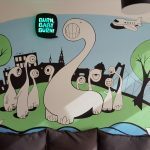 Those efforts were without a natural interest in taking risks, as Croatian culture was risk-adverse, where families expected children to either follow in a family business or seek government employment, less risky choices than taking a chance on starting a business. Her symbol for her presentation was a giraffe, as 1) its height allowed it to see opportunities and threats; 2) it sleeps with one eye open so it’s always alert; and 3) it has the biggest heart to reflect the importance of compassion and love. After a break, we toured the BIOS facility and had separate meetings with five of the incubator’s users. My sub-group met with EM2, a software creator producing programs for an Italian company. The last speaker before lunch was Bela Ikotic, the Secretary of Osijek Software City, a consortium of IT businesses who have joined together to promote the IT industry for their city. Despite a total absence of government support, his group has made Osijek the #2 IT city in Croatia, trailing only Zagreb. After lunch and a productive discussion, we boarded the tram again. For those who lived in Milwaukee in the 50’s, think “streetcar.” We traveled to the offices of Inchoo, a marketer support eBusiness and its CEO/Founder, Tomislav Bilic. His business grew from a single employee in an apartment to 57 employees filling the entire third floor of an office building. His support services reach dozens of countries, his biggest customers being in the USA. His staff dress casually and enjoy an atmosphere of relaxed enjoyment in their work. Back at the hotel, we shared a social hour, then dinner at the Restauran Rustika. Afterwards a few of us gathered in the hotel bar for drinks, pastries, camaraderie and a lively discussion. I even had to swear off puns at one point. Finally calling it a night at 12:55. Yawn . . .
Seminar participants at BIOS, a business incubator, in Osijek. WOW! It’s only been three days after we touched down and we are on the ground, on the bus actually and rolling!! We went to the University for part of our day. They definitely strive to keep their centuries long culture alive, the walls in the faculty had the old Croatian alphabet symbols. We met with students that attend the university and were able to have an exchange about the similarities and differences in our cultures, countries and people. America is fast, fast at everything, Croatia is more laid back. They have a deep history and culture going back thousands of years! The population of Croatia is 4 million in the country. As our new friend, host Ero says “all you need to know about every culture is how to eat good!” and we have! Our dinners are full platters of meats, sausages, veggies, fish, seafoods. My belly is full and yet I am hungry for more! Our focus for the day was Agriculture, we visited two different meat processing plants, got to see their production of pigs. We visited the Zito company, they make a variety of pig product foods-salamis, sausages, prosciutto (it’s like super thin summer sausage with a kick!). I’ll spare the details of the visit, but we got to see way more than this meat lover would like to see!! I was impressed, and blown away! Why and how is this important to Leadership? And to Wisconsin?! We’re looking at similarities and differences in procedures, policies, regulations and so much more. We’re looking at different aspects of leadership components, as there are so many, so many different styles and modes, from government to meat managing to education. Parts of the country do remind us of Wisconsin, the beautiful green trees, grass, and water. We miss home, and we are enjoying this beautiful country! Today we left Osijek for Zagreb. Packed, had breakfast, checked out and on the bus to Zagreb by 6:30 am. 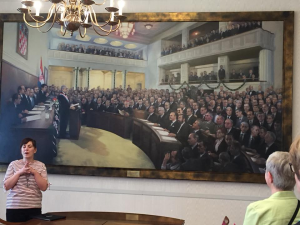 Our first stop was at the American Embassy, located just outside the capitol city. No electronic devices or cameras were allowed. We were greeted by Marissa, a Croat who was the longest working embassy employee—23 years!—and Marine Sgt. Zichi from Michigan (admitted he was a Lions and Red Wings fan). After talks from each of them, we heard from representatives of the political and consulate departments, followed by Doug Jones, the Deputy Mission Director. The Ambassador was gone, so we didn’t get to meet him. For lunch, our bus driver knew a great restaurant and ended up backing the bus into its lot by moving forward first to block four lanes of traffic then squeezing through a narrow arch. The food was great—filet mignon with mushrooms and French fries and a small bottle of Merlot—and cost 138 kuna, or $23.00. We then traveled by bus to a spot allegedly near the Parliament building. The area is very old with narrow cobblestone streets and buildings with no space between them. We ended up going through a series of tunnels and up several tall staircases before we found the entrance. Ana our guide was very gracious and gave the details of Croatian self-governance. We sat in the chamber where the County Representatives used to preside until the Parliament was reduced from two chambers to one. We then visited the Plenary in session, arguing in Croatian. No pictures were allowed. 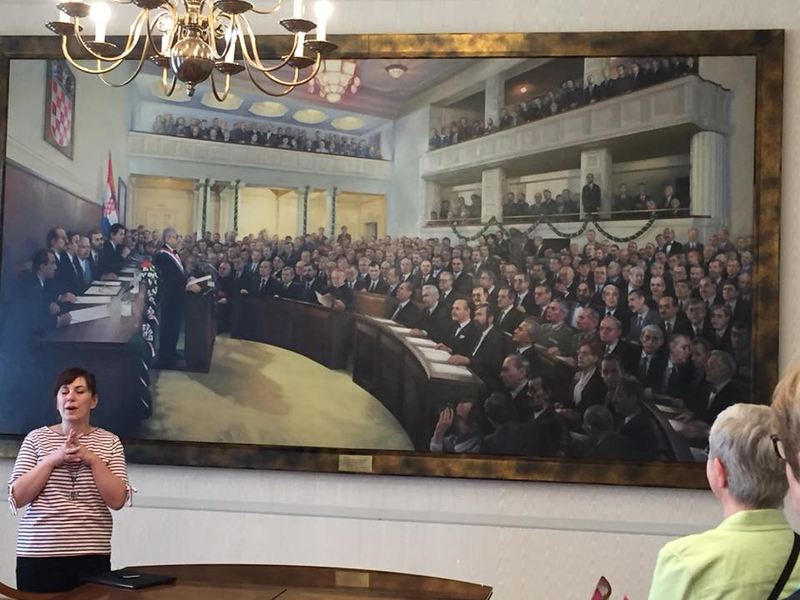 A picture of a painting of the Croatian Parliament approving their Declaration of Independence and Constitution. Note the Cardinal in the front row; Croatia is majority Roman Catholic. 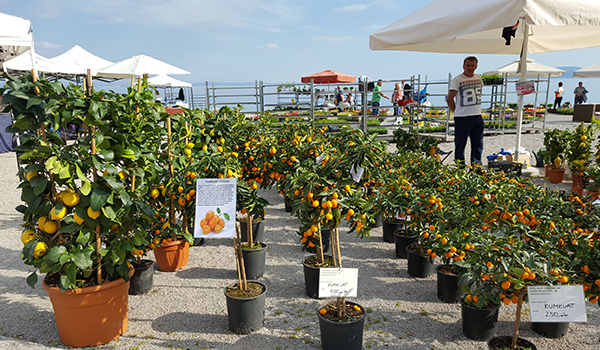 We awoke to another beautiful Croatian morning with sun shining and market vendors lining the walkway near the shores of the Adriatic Sea. Following breakfast, we divided into small groups and ventured onto the streets of Split for an interactive and engaging adventure into the city’s culture and history. To make the journey more noteworthy, teams were given a cultural activity, leading them to the local market, to stimulate the experience. Lastly over lunch at a local restaurant of choice, groups were asked to learn more about popular dishes most commonly eaten by locals. Thereafter, the group reconvened for a historical walking tour of Split inclusive of the Diocletian Palace, St. Duje’s Cathedral, Peristil, Statue of Gregory, Golden Gate, Vestibul and so much more! To learn more, visit (http://diocletianspalace.org/). The evening concluded with an authentic dinner at Restaurant Tifani, located within Hotel Peristil and situated at the heart of the Diocletians Palace, where we were briefed by a member of the hotel staff on its history, current and future impacts of tourism, strengths and challenges as identified by its leadership, and their overall goal to deliver a great experience throughout their visitors stay. Finally, over the most fabulous dessert, each small group shared their discoveries made at the market. Amazingly, there were minimal commonalities in relation to information gathered. The fun-filled experiences of the day’s travels were remarkable and truly instrumental in each individual’s understanding of citizenship in Split, and the food culture of Croatia. Today, we ventured outside the city and Diocletian Palace walls for another beautiful Croatian day to learn about the country’s changing markets and gain a greater understanding of the business models adopted by its industrial businesses. 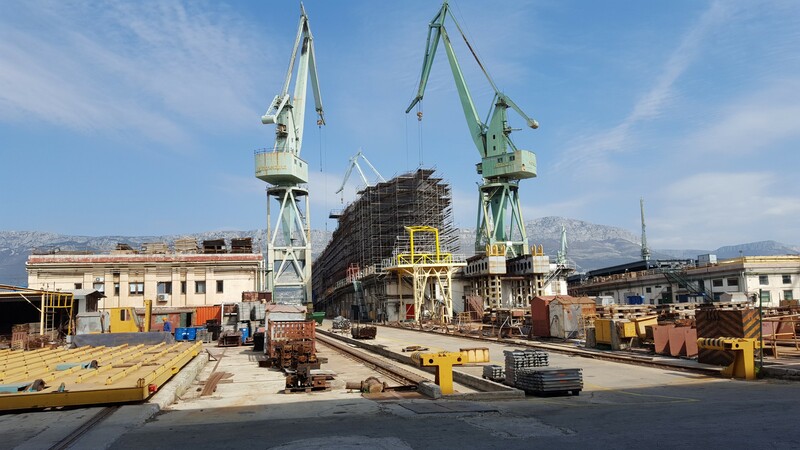 Our first visit was to Brodosplit, the country’s largest shipbuilder with its roots dating back nearly 100 years to 1922. Upon arrival, Josip Jurišić, Public Relations Manager, greeted us with a warm welcome and invitation to tour the on-site historical museum featuring historical artifacts, documents and replica model ships from prior client designs. Following the museum tour, Josip led us through the ship grounds delivering a high-level overview of the processes involved in the production of a large ship, concluding with a tour of the latest ship under construction (cruise ship client) to help bring our learnings into perspective. Brodosplit was an eye opening experience for a number of us. Furthermore, its historic economic structure represented a “planned” model, and more recently transitioned to a “private” marketplace model. Its capital infrastructure reflects flexibility and is an excellent model for positive relations at the intersections of public and private economies. Our next visit was over lunch at Restoran Perlica, where we heard from Jakov Vetma, Mayor of Klis Municipality. Jakov has been in office since 2013 and also serves as the president of the Croatian association of historic cities for nearly three-years. Before being elected mayor, his primary work focused on protecting Croatian heritage. 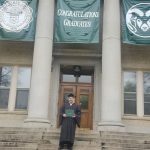 He’s found success bringing that profession background to policy in Klis, creating an environment focused on preserving Croatian heritage and welcoming new people and ideas into the community. The day concluded with a trip to the ancient Klis Fortress, known for its role in the Game of Thrones — fourth season.